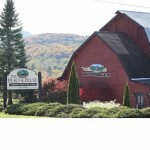 The Publyk House restaurant in Bennington, VT has been a Southern Vermont favorite for more than 40 years. Casual New England fare offering a bountiful salad bar nightly with spectacular views of Mount Anthony. The renovated red barn still exudes that same warmth and character as the yesteryear with barn board paneling, multiple fireplaces and rich, wood-toned Tavern. The large outdoor deck offers guests seasonal dining al fresco with panoramic vistas. Specializing in seasonal New England favorites such as Roast Prime Rib and Baked New England Cod. A more casual Tavern menu and a more complete Dining Room menu are available. Serving all holidays. The NEW Orchard Room offers a banquet setting with beautiful views and sunsets.